The Simms Intruder Boot - Salt are Simms wading boots that are a quality, durable and comfortable Simms wading boot that is designed for technical fly-fisherman to provide you with a very innovative wet wading system. This saltwater Intruder boot is designed with integrated neoprene sock that is designed specifically to inhibit debris from entering this wading boot so you don't have to worry as much about gravel or other types of debris from getting into your wading boot while you are enjoying your fly-fishing adventure. This Simms Intruder Boot -Salt also contains a full neoprene lining to provide fly-fisherman with a wading boot that has extra cushioning and is easy to take on and off. This Intruder saltwater boot also has a dual-density EVA midsole to provide anglers with added shock absorption. The Simms Saltwater Intruder Boot is also constructed with welded TPU pads in the high abrasion areas to provide this wading boot with added abrasion resistance where it's needed most. 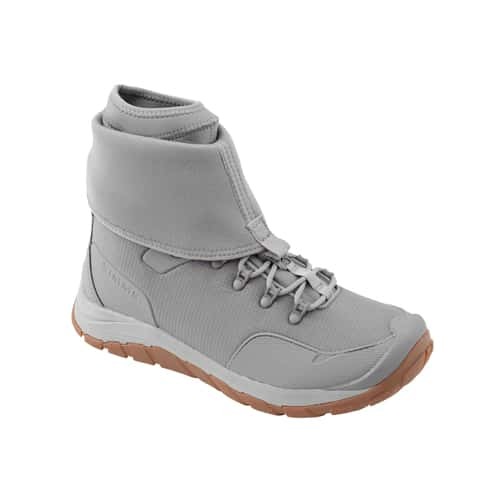 These Simms Intruder Salt Wading Boots are designed to be worn barefoot or with Simms neoprene wading socks, so you can wear this Intruder boot however you prefer. This wading boot is designed with the Vibram Megagrip rubber outsole that is extremely innovative and feature-rich in every way. The Vibram sole is a rubber outsole that provides saltwater fly-fisherman with a wading boot that has superior gripping power on wet and dry surfaces and will provide anglers with a boot that is great whether you are on a long day hike or wading at your most favorite fly-fishing destinations. APPROX. PAIR WEIGHT (size 11): 47.1 oz.